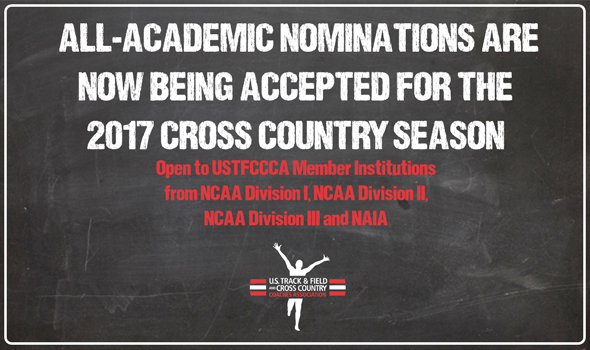 Nominations for the 2017 USTFCCCA Cross Country All-Academic Awards are now open and will remain open until Friday, January 26th. For the first time, NAIA programs and student-athletes will be recognized for All-Academic honors by the USTFCCCA. Academic and athletic criteria requirements are listed below and on the nomination form. All nominations are subject to review for accuracy and errors. Please only nominate teams or student-athletes that fulfill ALL the criteria as listed. The deadline to nominate is Friday, January 26th at 5 p.m. CT. Approximately two weeks following the nomination deadline, we will announce the recipients. 1. Cumulative GPA of 3.25 or higher on a 4.0 scale, including the most recent grading period. Institutions utilizing a different GPA scale must convert the GPA to a 4.0 scale using the standard conversion method [GPA/Scale x 4.0]. 2. Completed a minimum of one (1) semester or one (1) quarter at the nominating institution. 3. USTFCCCA Division I Cross Country All-American finisher OR top 25 finisher (or top 10%) at an NCAA Division I Cross Country Regional meet. Divide the cumulative number of quality points earned by the cumulative number of semester or quarter hours completed. Institutions utilizing a different GPA scale than 4.0 then must convert the GPA to a 4.0 scale using the standard conversion method [GPA/Scale x 4.0]. Data must be certifiable by the institution’s registrar’s office. 1. Cumulative GPA of 3.25 or higher on a 4.0 scale through the end of the semester/quarter of competition. Institutions utilizing a different GPA scale must convert the GPA to a 4.0 scale using the standard conversion method [GPA/Scale x 4.0]. 2. Completed at least 12 semester/quarter hours through the semester of competition at the institution. Team cumulative grade point average of 3.0 on a 4.0 scale, including the most recent grading period. Institutions utilizing a different GPA scale than 4.0 should first calculate the cumulative GPA and then convert the GPA to a 4.0 scale using the standard conversion method [GPA/Scale x 4.0]. Institutions utilizing a different GPA scale than 4.0 then must convert the GPA to a 4.0 scale using the standard conversion method [GPA/Scale x 4.0]. Data must be certifiable by the institution’s registrar. All eligible student-athletes whose names appear on the NCAA Eligibility Form and used a year of eligibility must be included. The team must have competed and compiled a team score at an NCAA Division II Regional Cross Country meet. 1. Minimum cumulative GPA of 3.30 on a 4.0 scale through the end of the fall semester of competition. Institutions utilizing a different GPA scale must convert the GPA to a 4.0 scale using the standard conversion method [GPA/Scale x 4.0]. Team meets the NCAA criteria for cross country sponsorship (five meets with a minimum of five runners competing at each meet). Team roster must include every individual who used a season of eligibility. Graduate students must take all undergraduate plus graduate coursework into account. An institution’s team roster must have a minimum cumulative team grade point average of 3.1 on a 4.0 scale through the most recent semester/quarter. 1. Cumulative GPA of 3.25 or higher on a 4.0 scale, including the most recent grading period. 1. Institutions utilizing a different GPA scale must convert the GPA to a 4.0 scale using the standard conversion method [GPA/Scale x 4.0]. 2. NAIA Cross Country National Championships qualifier. 3. Completed a minimum of one (1) semester or one (1) quarter at the nominating institution. Divide the cumulative number of grade points/quality points earned by the cumulative number of semester or quarter hours earned.